Domenico Gargiulo – FundaciÃ³n Casa Ducal de Medinaceli. 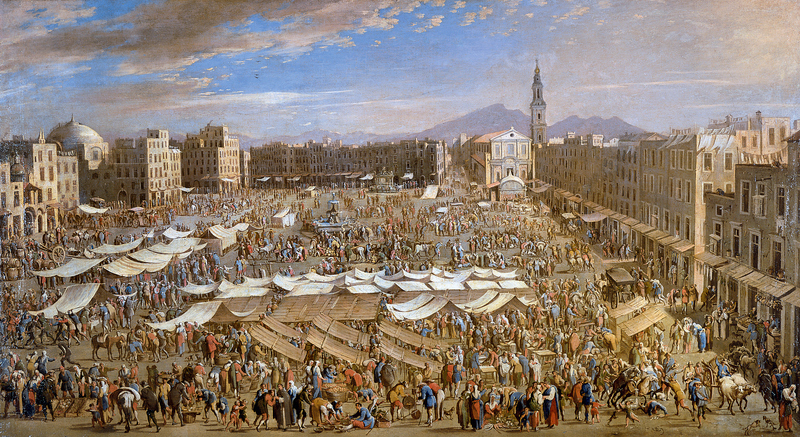 Title: La plaza del mercado de NÃ¡poles/Piazza Mercato, Naples. Date: c. 1654. Materials: oil on canvas. DImensions: 76 x 141 cm. Source: http://www.museothyssen.org/microsites/prensa/2011/Arquitecturas-pintadas/img/Gargiulo.jpg. P.S. I have changed the light, contrast and colors of the original photo.